Some months, trying to keep up with two blogs is almost more than I can handle. September was so busy over at Gardening Gone Wild, with judging the GGW Picture This Photo Contest and coordinating the Garden Bloggers’ Design Workshop, that I was tempted to rename this blog Gardener Gone AWOL. But now I’m back, and it’s way past time for a new installment of Three Neat Plants. This month, I’m starting small, with a great little bush basil named ‘Pistou’. I’ve grown many kinds of basil over the years, not so much for cooking as for the foliage interest of the purple and variegated kinds. But last year, I fell for the high cute factor of plain green ‘Pistou’ in its Park Seed catalog photo, and I gave it a try. It did okay in the cottage garden at work but wasn’t wow, so I didn’t order the seed again. But I found some left from last year when I was sowing this spring, so I figured I’d give it one more try, and I’m very glad I did. It performed beautifully in my little kitchen garden at home and grew just as neatly as promised. 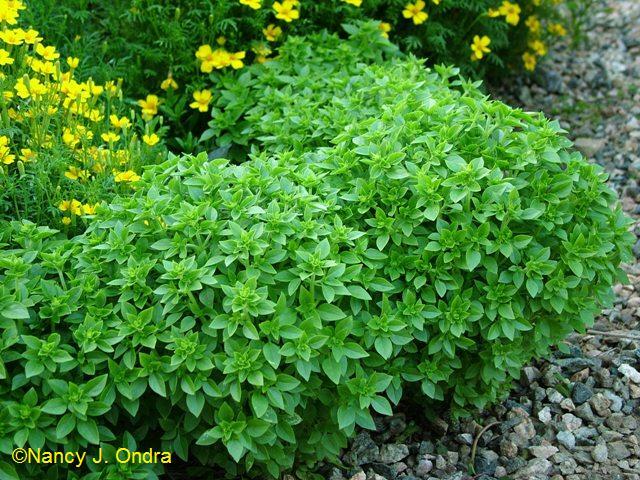 Unlike other bush basil strains, which tend to produce variable leaf sizes, the ‘Pistou’ plants were remarkably uniform. Set about 6 inches apart, the plants quickly formed little topiary-like spheres, then gradually grew together into an edging hedge that looked for all the world like an ultra-mini boxwood – but with a much better scent! I’m not much of a judge of the exact flavor as compared to other basils, but I thought it was appropriately basil-like, and there were certainly plenty of tiny, tender shoot tips to pick for salads. ‘Pistou’ has definitely earned a place on my must-grow list for next year, and I look forward to trying it as an edging along my front path, or in another spot where I’d be more likely to brush the leaves as I walk past. I think it would be fun as a no-prune temporary topiary in a pot, too. If you want to try ‘Pistou for yourself, you can get the seed through Park Seed. 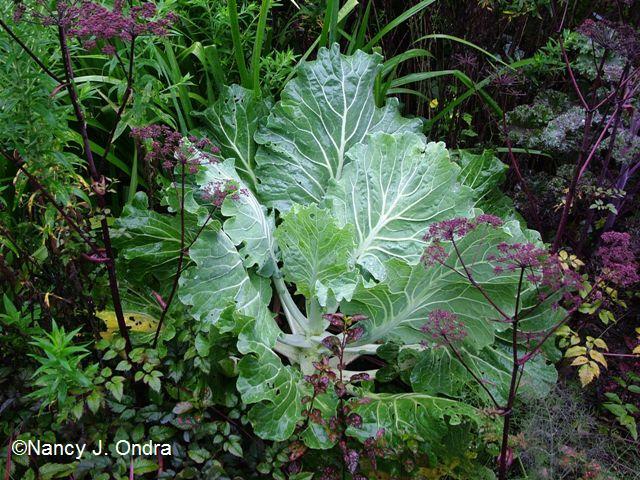 The Cook’s Garden offers both seed and plants. 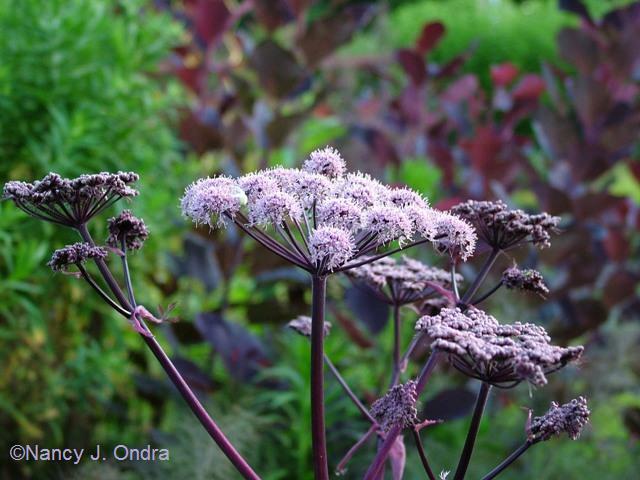 Another cool plant that qualifies as both an herb and an ornamental is an absolutely gorgeous angelica named ‘Ebony’. I found this one in the Plant World Seeds catalog (one of my most favorite sources for neat plants) two winters ago and sowed the seeds outdoors in pots in February of 2008. The seedlings emerged in April and were dark-leaved through their first growing season. This spring, the new foliage truly was nearly black, in rosettes that were about 2 feet across. The flower stalks shot up in early summer, with outstanding plump buds. The flowering stalks, shown here in late June, were somewhat sparse but still striking. By late July, the plants were beginning to bloom, and they continued through about the third week of August. The foliage on the plants at work (shown above) was mostly green by bloom time, and the still-dark stems topped out at about 3 feet. My plants at home were shorter, reaching barely 2 feet in bloom, and they started flowering about 10 days later. All of the plants were from the same seed batch, so the difference was likely due to the growing conditions. The plants at work, for instance, were pretty much in full sun and very rich soil, while those here got about 4 hours of direct sun a day and grew in average soil. All of them had flowers that were light pink (as above, just opened in late July), aging to darker pink (shown below in late August, with couve tronchuda). 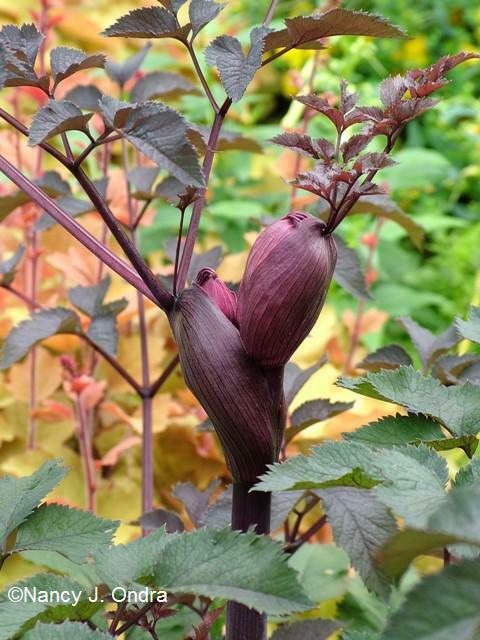 The botanical name of ‘Ebony’ usually doesn’t appear with a specific epithet (simply as Angelica), but based on the form of the umbels, I’m guessing it’s a strain of A. sylvestris, which would make the hardiness range somewhere around Zones 5 to 9. You can get seed directly from Plant World Seeds. If you run a web search on Angelica Ebony looking for other sources, I suggest using the highest setting on your “adult” filter to avoid some highly irrelevant search results. Honestly, the plant isn’t very interesting until flowering time, but it’s worth waiting for because of the fantastic display at a time that many other perennials are either fading out or getting ready for later bloom. 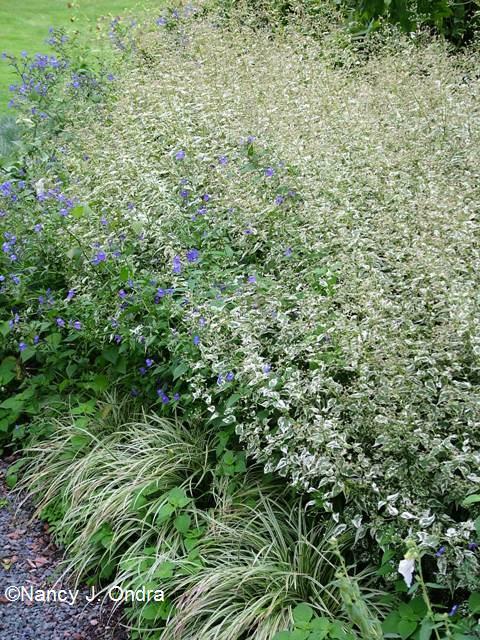 If I could grow only the straight species or the cultivar, I’d probably choose ‘Snow Fairy because its foliage contributes to the garden throughout the growing season. But if you have the space, it’s definitely worth trying the species too. Both are deer-resistant and should be hardy in Zones 6 (maybe even 5) to 9. The species self-sows a bit; no seedlings from ‘Snow Fairy’ so far. 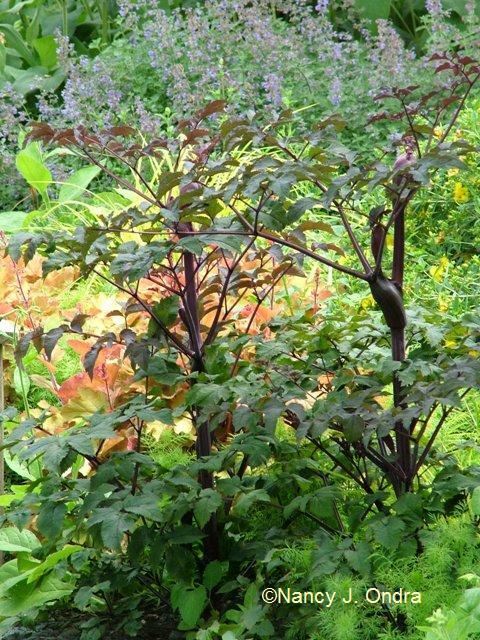 Both plants prefer full sun but seem to tolerate a few hours of shade too; average, well-drained soil is fine. 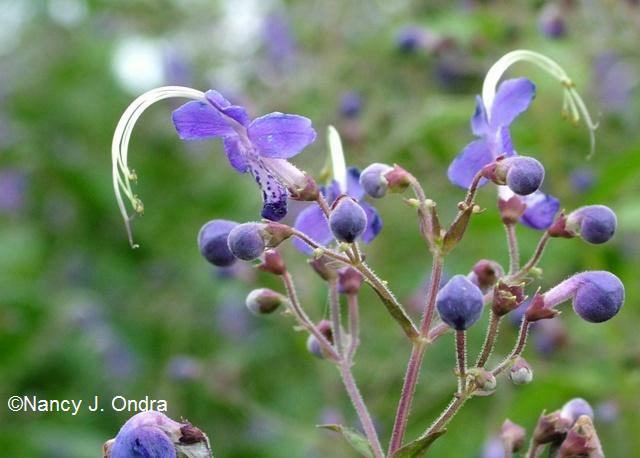 It can be hard to find non-variegated plants of Caryopteris divaricata, but I see that Deer-Resistant Landscape Nursery lists the species, and Plant Delights offers a green-leaved selection called ‘Blue Butterflies’. On a final note, I wanted to thank all of you who voted Hayefield as Best Pennsylvania Blog in the 2009 Blotanical Awards. But I’d also like to recognize the other four PA finalists, including the inimitable Poor Richard’s Almanac, written by my friend and former co-worker who goes by the on-line moniker of Our Friend Ben, as well as three other blogs that were new to me: Burbs and the Bees, based in Pittsburgh; Veggie Gardening Tips from central PA; and My Little Patch of Green. Congratulations to all of my fellow Pennsylvanians, to our Gardening Gone Wild team for winning Best Landscaping Blog, and to all of the other finalists and winners. Hi, just drop by to visiting your lovely blog & post. What a lovely basil plant. I never seen one so uniform. Would love to hear your comment about my garden and thoughts from you. I appreciate your visit, James. Thanks for letting me know about your blog! I really love that basil and wonder how it would do here. Congrats on your win, Nan. It is well-deserved, as is GGW’s award. I think you’d have to water the basil a lot, Pam, but otherwise I imagine that it could do all right. Congratulations back to you for your well-deserved recognition in multiple categories for Digging. I can’t get over that basil being so architecturaly interesting and still you can eat it. I have tried caryopteris in several different forms and it never comes back for me. If I have it I have to use it as an annual. I love the blue froth that it waves in the garden. Congrats on your award. Sorry to hear that caryopteris is uncooperative for you, Lisa. But the basil should do well, and yes, it’s both cute and tasty. I always have to have some sort of basil in pots on the deck so I can squeeze the leaves and enjoy that wonderful scent .. this type looks amazing .. just like a mini boxwood hedge is right ! If you check out the link to Cook’s Garden, it shows ‘Pistou’ in a pot; the photo’s not great, but the plant is a charmer, looking just like it’s been sheared weekly to form a perfect ball. I think it’s definitely worth a try! Thanks, Frances, and multiple congrats to you as well! I’m glad you enjoyed the plants this time. I have lots more lined up for the upcoming months. You’ve made me a fan of that basil. I can see all kinds of uses for it along borders. Then of course there is the edible aspect too. We just had pesto last night from the garden and I can see adding a whole lot more basil next year. 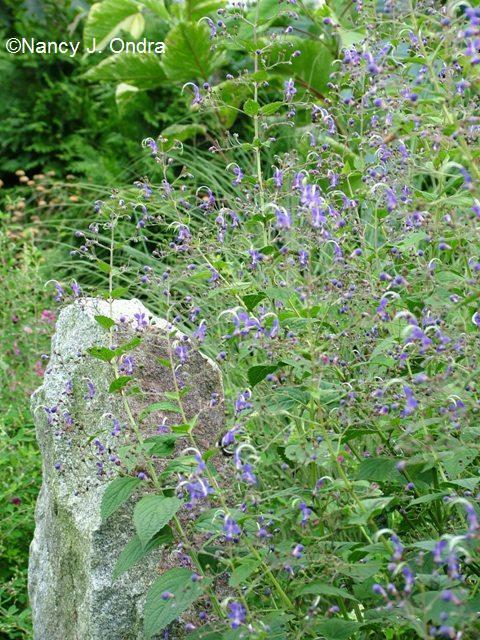 I like the caryopteris too, and anything that is deer resistant is worth a try here. I’d bet that the basil would be deer-resistant too, Dave. And just one package of seed gives you plenty of plants for both decorative edging and harvesting. By the way, I did a sniff test on both caryopteris today in our Deer-Resistant Garden at work, and I still didn’t detect much of anything from the species, even when I crushed the leaves. But boy, ‘Snow Fairy’ sure did have a strong odor when I ruffled the leaves. It’s not something I’d noticed before when just working near the plants, though. Thanks for another post full of wonderful plants and ideas. This is the first year I’ve planted herbs – a gift from my friend Ruth at Roses in Thyme. One of the plants she gave me was Pistou. It performed exactly as you say. Thanks for the idea to use it for an edging plant. I think I’m hooked on herbs. It’s an easy addiction to fall into, Marie. 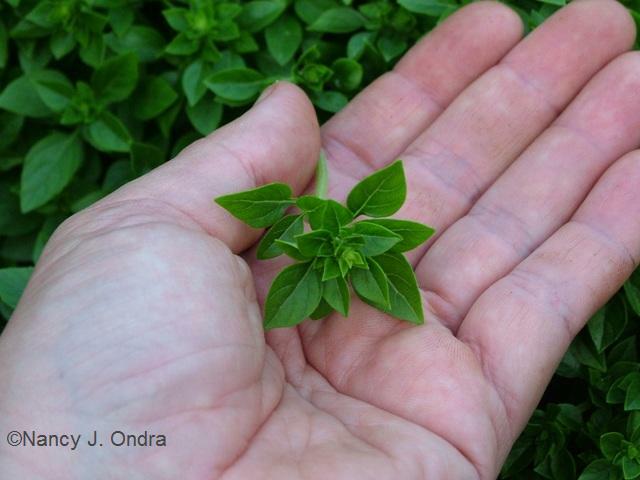 Fortunately, there is no cure; you must keep growing more and more herbs. I’m glad ‘Pistou’ performed well for you too! Nan, three lovely plants. I have often admired the Angelica one day I will get some seeds. I do like the basil and I have put it on my list to see if I can find some seeds of this variety. I especially like it as a ‘mock’ box hedge and want to grow it like that. Brilliant, Sylvia! I like the name ‘Mock Box’ basil much better than ‘Pistou’. So, have you been convinced to start your own blog yet? I hope so! I’m going to keep that basil in mind for next year as an edger, even though I don’t cook with basil. 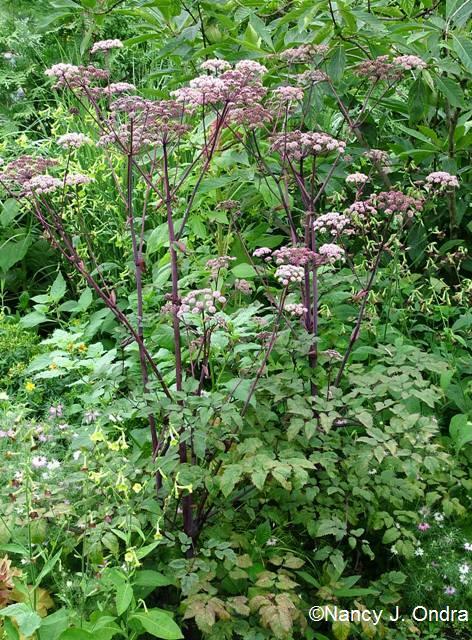 The Angelica is one of those plants I long for, but fear wouldn’t do well in my very dry soil. Thanks, MMD! While I don’t normally do much with formal edging plants, this basil has inspired me to try a few more hedge-edged beds next year. I’m thinking that a couple of plants together could look really cute in a window box, too. Hi Nan! I was a bit disturbed to see that initial flower photo followed by a description of basil. What a relief to get down to the angelica! But ‘Pistou’ is now definitely on my list, and thanks for the introduction to Plant World Seeds. And of course thanks for the mention of Poor Richard’s Almanac! Hayefield’s and GGW’s Blotanical wins were very well deserved, and I’m looking forward to enjoying more wonderful posts from you in 2010! Yeah, I originally started with a photo of the basil, but it wasn’t nearly as exciting, and I had a surplus of angelica shots. I should have tried to arrange that better, but hopefully no one got too confused. It’s a good reminder that one should not blog when overtired. Congrats on your win. I love your blog. That Angelica is just beautiful! I appreciate your kind words, Susie. The angelica is a favorite of mine, too! Off on a tangent about irrelevant results. An “adult” searcher picked up my post about wild Disa orchids. Don’t want to know why. Oh my! If you think that’s bad, imagine what kind of results we get with Gardening Gone Wild. Mmmm…my goodness. I think I must have some of that angelica. Thank you for introducing it to me. Congratulations on your Blotanical award! It’s well-deserved and I look forward to more of your informative posts and beautiful photography. Well done, Nan! Congrats to you too, Kylee! And I’m glad that you’re as enamored of ‘Ebony’ as I am; it’s a beauty. ‘Pistou’ is beautiful..I love basil in my garden..love the fragrance..but I never thought of planting them in garden( i always had them in pots in summer)…i thought it is an annual until i read your post..i love the way you have in your garden with the yello flowers..
‘Pistou’ is an annual for us, Raji, just like other basils. It grows just as well in the garden as in pots, but you have to wait until after the last spring frost to plant it outside (it hates being cold), and it’ll last only until the first frost. Having ordered from Plant World many times over many years, I’m well aware of how they like to come up w/ more sell-able names for plants. I avoided the Angelica b/c it sounds identical to ‘Vicar’s Mead’ and A. stricta ‘Purpurea’ (both of which seem the same plant). Your pics seem to confirm. Is it different, or now just more confused? 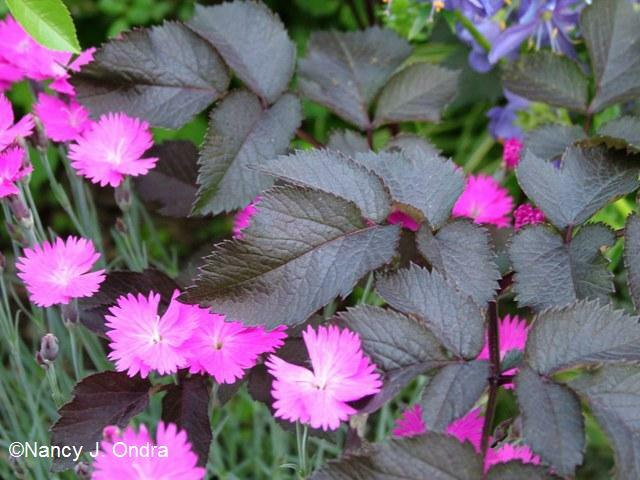 I haven’t grown the three side by side; in fact, I haven’t come across plants sold as A. stricta ‘Purpurea’ at all. But I did try ‘Vicar’s Mead’ years ago, and if my memory is correct, it was not nearly as consistently dark-leaved as ‘Ebony’ after the first leaf or two. I am impressed with the Angelica, however, I am wondering a bit more about the germination technique. I have tried several years to grow Angelica here in Indiana, but with little success. The first year none of the seeds sprouted at all. The second effort resulted in one spindly seedling emerging out of a whole packet of seeds. Is there something about a February sowing that works so much better? Also, do they like marshy/moist soil? Angelicas seem to like soil that’s evenly moist but not water-logged. Purchased seeds usually germinate well for me with outdoor sowing in February (or sooner if I get them earlier). I think the most important thing is getting seed that’s as fresh as possible. If it’s too old, or if it’s been stored too warm or dry, then there’s little or no germination, in my experience. I get the very best results from tossing just-harvested seed into the garden in late summer and then waiting for the seedlings. We did a little sort of trial of a bunch of the teeny basils last year and Pistou was my very fave. I love how you used it as a mini hedge. ‘Snow Fairy’ is another fave of mine. It’s a beauty in the garden and it even holds up pretty well in arrangements. Hi Kris! How cool that you did a more formal comparison and ‘Pistou’ still came out the winner. And thanks for the tip on ‘Snow Fairy’ being good for arrangements. I know what you mean about feeling like Gardenblogger Gone Awol. I’ve been the same way. So many things to do, not enough time to do them all in. I love the Angelica and may put it on my must find list. Always some great plants in your posts. Thanks for taking the time to visit, Jodi! Yes, it seems as though there simply aren’t enough hours in the day to get everything accomplished. Thanks for the support, Dee. You seem to manage juggling lots of writing projects better than I do! Angelica has become more and more intriguing to me over the years; as always, thanks for some beautiful images that make it even more tempting. Thanks for visiting, Elizabeth. I should have another oddball angelica species to share next summer. Love the basil hedge! 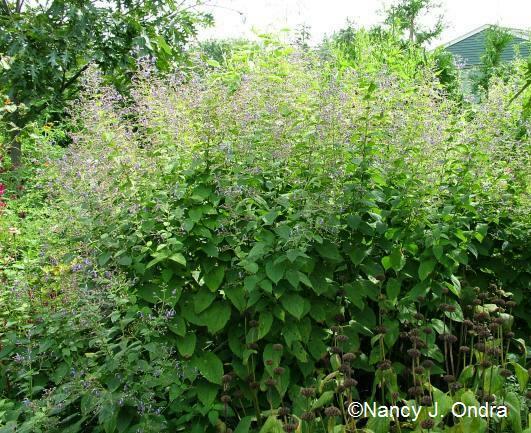 That is a lot more attractive than the usual tall sweet basil I grow… will have to try it! Hi there, Ginger! I hope you enjoy ‘Pistou’ as much as I have. Hi Nan! I’m curious if that pistou basil is French? There is a pistou soup from the south of France that is made from basil–kind of like pesto but minus the cheese and nuts. I don’t know the origin of the strain itself, but I did find references to the “pistou” you referred to. So that makes ‘Pistou’ kind of a dumb name for one particular kind of basil – kind of like naming a tomato ‘Sauce’ or a bean ‘Soup’. 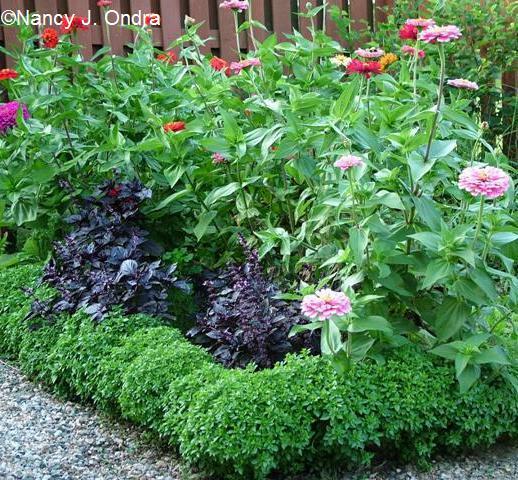 Loved your photo of the basil – my question is how do you keep your zinnias from flopping onto the basil plants? Do you stake them? I love planting taller zinnias but by the end of the summer that have flopped over and have completely covered the shorterr plants in front! Thanks, Pat. I cut those zinnias often for bouquets, so the plants were very bushy rather than tall. No staking required, thank goodness. I suggest you ask the folks who introduced it: Plant World Seeds.